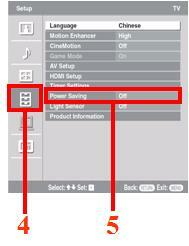 按下遙控器上的 選擇 Settings ，並按下 . by 按下遙控器上的 ，選擇 ，並按下 . 按下遙控器上的 ，選擇 Off、Low、High或Picture Off，並按下 .